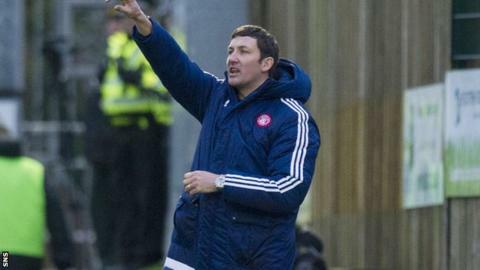 Hamilton player-manager Martin Canning is determined to stay in charge despite a shock 4-1 defeat to Annan Athletic in the Scottish Cup. Canning is under pressure following the Cup exit and just one win in their last 13 Premiership games. "I'm bitterly disappointed but credit to Annan," said Canning. "We're a Premiership club and I expected us to come down here and win - but we were miles off the type of performance I ask for." League Two Annan Athletic stunned their Premiership visitors as Matt Flynn's strike gave them an early lead before Josh Todd's shot doubled their advantage. Greg Docherty's effort reduced Hamilton's deficit midway through the second-half, but two goals from Rabin Omar secured a famous win for Jim Chapman's side and put them into the fifth round. "As a manager you've got to belief in yourself and that's something the players need to do too," said Canning. "Results-wise I know they've not been good enough of late but at least I've been able to say performances have been good. Today they were nowhere near that. "But I'm not considering my own position. I still believe I can turn this team around. I proved it last season when we came out of the bad run we were on then. "I'll obviously speak to the board and we will discuss it but at the minute I just want to focus on working hard." Midfielder Darian MacKinnon has insisted that Canning should not get the blame for the defeat. "Fans are always going to react - especially after a defeat like that," he said. "We are all behind him. It's not his fault we've given away four goals away. It's the players who are responsible. "How can you blame the manager for individual mistakes? "It was embarrassing. A rubbish day. I'm lost for words. "It was four defensive mistakes which cost us again - the same sort of thing that has hurt us in the league. "If we can't beat Annan while giving away goals, we've got no chance in the Premiership."